The webmail Sharing feature lets you give others access to items in your account. You specify which items to share and the level of access. You invite a user to share, and the user can accept or decline the invitation. The Sharing page under Preferences helps you manage your shared items. This page shows the folders you shared with others and folders that are shared with you. You can share your items with specific internal and external users or make an item public. External and public users can only view content - they cannot make changes. When you share an item with internal users, you determine the type of access privileges to give the user. You can set permissions per user or group. You can edit the access rights and revoke permissions at any time. You assign internal users or groups privileges using roles. The user or group must have a valid address in your organization’s mail server. None: Temporarily disables access to a shared item without revoking the share privileges. Users still have the shared item in their mailbox but cannot view or manage the content. Please Note: You can share any of your mail folders, calendars, address books and task lists except the Trash and Junk folders. We have included step-by-step instructions below on tackling the most common Item Sharing tasks (see them listed directly to the right). Click on a task description (e.g., Sharing a Folder) and it will allow you to jump to specific instructions below. Then, click the browser back button to return to the top of the page. Move the contents from one folder to another folder in your mailbox. Copy an email message from your folders to their mail folders. Your folder also retains a copy. 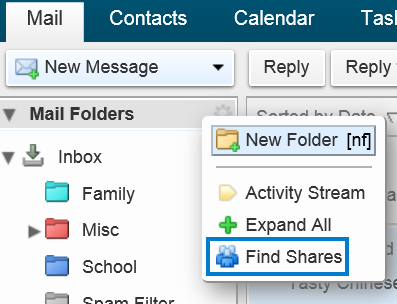 Create folders within the shared mail folder. The new folder appears in your mailbox. You can share your mail folders, address books, calendars, and task lists folders. You invite a user to share, and the user can accept or decline the invitation. • For Internal users or groups, enter the user’s email addresses. In the Role area, select the access privileges. • For External guests, enter user’s email addresses. 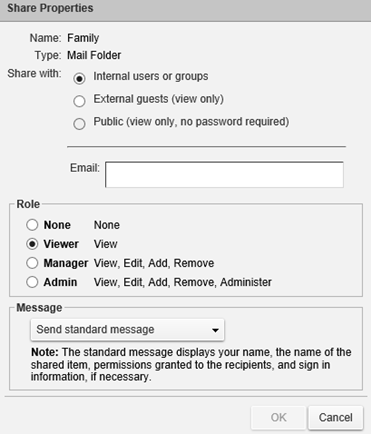 External guests are sent an email with a link to the shared item. They create a display name and password the first time they go to view the shared item. • For Public, enter the URL to use. Step 4. In the Message area, select which type of message to send to those to whom you are granting access. This message can be sent to internal users and external guests. Please Note: If you selected Public, you must notify the public of the URL. You can change the Sharing privileges that you have assigned to a user or group. Step 1. Right-click on the shared folder to change and select Edit Properties. The Folder Properties dialog box displays the names that share the folder. Step 3. In the Share Properties dialog box, change the privileges. You can temporarily disable access to a shared folder without revoking the share privileges by selecting None. Step 1. Right-click the shared folder and select Edit Properties. The Folder Properties dialog box displays the names that share the folder. Step 4. Click Yes. The user can no longer access your folder. If you receive an email notice that you have been granted access to share another person's mail folder, you can accept or decline the share. If you accept, the shared folder displays in the specified application’s list in the overview pane. This information is not actually saved in your mailbox. Step 4. Click Yes. The folder is added to your overview pane, and the message is moved to your Trash folder. Sometimes you might not get an email notification that an item is shared with you, or your organization might have shared items with the public that you would like to find. The Find Shares link helps you find items that can be shared with you. The Find Shares link is at the bottom of the Folders section in the overview pane. Step 2. 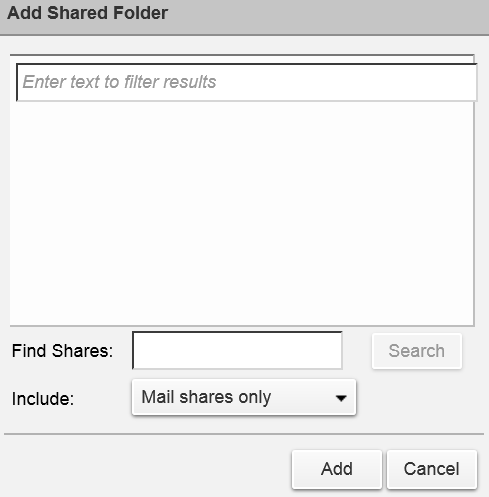 In the Add Shared Folder dialog box, select the item shared with you that you have not accepted, or in the Finds Shares text box, enter an email address to see if an item was shared with you from that address. Step 3. In the Include drop-down menu, select which application to search. Select All Applications to search all applications for items shared with you. Show folders shared with me through a distribution list. This option is selected by default. 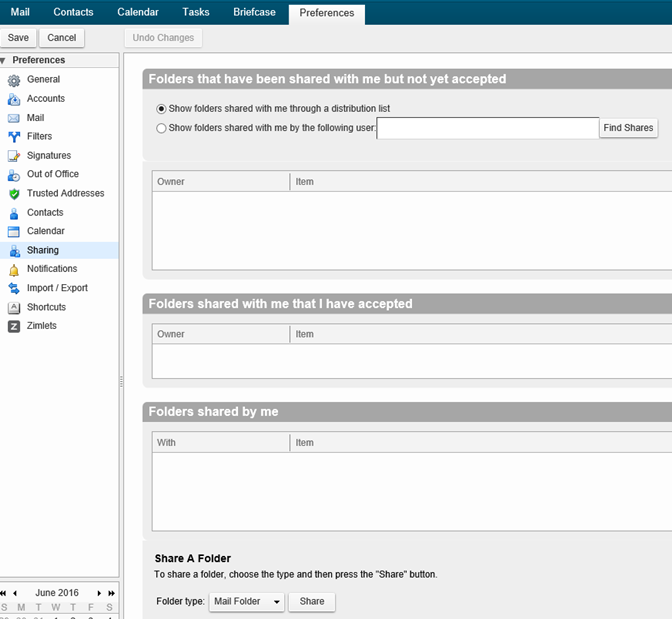 If folders are shared with you through a DL, the fields are populated with the shared item information. Show folders shared with me by the following user. When you select this option, enter a name of a user that has shared an item with you. The information is displayed in one of the fields depending on whether you have accepted a share invitation or not. You can view information from one user at a time. The details are not saved. Folders shared by me. In this section your shared folders are listed with details about how the share was set up, including the role you assigned the user and the item shared. You can edit the share properties, revoke permissions to your share, and resend the invitation. Share a Folder. You can share your email, address book, calendar, tasks, and briefcase folders from here as well. • For External guests, enter user’s email addresses. External guests are sent an email message with a link to the shared item. They create a display name and password the first time they view the shared item. • For the Public, enter the URL to use. In the Message area, select which type of message to send to those who you are granting access. This message can be sent to internal users and external guests. Please Note: If you select Public, you must notify the public of the URL.